I was a squire before him, you know. Four whole days. I mean, I guess that doesn't seem like a lot... but it is, I swear. I trained officially with my sword before him, and I got sent into those disgusting sewers before him, and I woke up at the crack of dawn before him, and I think I might have even been Master Torak's favourite before him — I swear. But, you know, the day he came in, there was this... aura around him, like he was constantly surrounded by light motes. I mean, he did seem to always be carrying motes around, and have them equipped to his weapons and all that, but that's not what I mean. I mean he just seemed special, you know? Like he was meant for great things. He had a hero's glow before he was even a hero. I really, really, envied that. Another year has gone by, and Y17 certainly gave us a lot of nice Neopet colours. 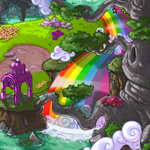 It saw the release of a brand new Paint Brush, and most Neopet species were treated to two lovely new colours at the Rainbow Pool. Looking back through the entire year, at all the new colours, I have chosen my favourites from each month. So not all colours and species will be represented in this list, which is just made up of my personal opinions. They`re not ranked, simply listed in order of release. Hello, Neopia. My name is Claire, and today I’ve ventured into the Haunted Woods to have a chat with everyone’s favorite Kacheek: Eliv Thade! He’s been nice enough to lead me safely through his castle (so far) to the library, where I now sit by a warm fire on a very dusty couch—but I’ll write that off for his lack of servants. While Thade prepares himself for my questions (he mentioned something about tidying his bandages), I try to make myself at home. But what is a Kacheek to do on Kacheek Day when one has only recently become a Kacheek? Ponder no longer, my newly-turned-Kacheek readers, for I have created a handy guide to celebrating our signature holiday. Drip, drip, drip…. I looked up at the ceiling. Water dripped from a newly formed crack onto the stone floor. Great. Another problem to make my life in here more miserable. I looked around my cage. There was no way to tell if it was day or night, not in this dark, windowless space. The only furnishings the room held was a small cot and a sink in the corner. My food and water bowls were empty, not that they were very full to start with. Three stone walls surrounded me, my only connection to the outside world being through the rusty bars of the cage. The pink Uni walked by my cage and stopped in front, giving me a sad smile. “How’re you doing, One?” I regarded her wearily. She was a kind soul with a gentle heart, but even so, there was only so much she could do, only so far her kindness could spread over those of us at the Pound. And there were so many of us. “My ceiling is leaking.” She peered up at the dank, dark ceiling. “Oh dear. I’ll see if I can find a bucket somewhere.” “Thanks.” I settled back with a sneeze. “Still no luck with a cure?” “Afraid not. I’m sorry One. The pharmacy only has so many Magic Cookies…” I sighed. “It’s okay. I didn’t have high hopes.” I never have high hopes for anything now. The foliage was springy underpaw as Lopez stepped through the jungle, a camera strung around his neck. After a pawstep, the leaves would jump right back up to where they had been a second before. As the Kougra walked on, the sun grew fainter and fainter, the surroundings growing dark. Bright green plants changed into dark bushes as he walked on. The Blugar on his shoulder made a soft purring noise in his ear, as if to reassure him. Muttering soft, soothing sounds to the petpet, Lopez continued to walk into the increasingly dark area. He turned his head. Behind him was where he had started. The sky bright colors, sand, palm trees... vaguely visible in the distance. Here, everything looked wilted. The trees were curved, the shrubs were dying, and the ground was black and hard. Vines covered his face, which he used his large paws to move away. Thorns pierced his fur, which stung, but he kept walking, the camera bouncing on his chest. He looked up. He had arrived. Tallydepp, the Royal Uni, galloped home from school, full of nervous excitement. "Woah!!" exclaimed her mum, as Tallydepp came hurtling through the door. She put the Uni cake she had just baked in the oven on the kitchen table and wiped her hooves on her apron. "Whatever has happened?" she asked. Uni cake was Tallydepp's favourite food and usually the sweet aroma would stop her in her tracks, but today the excited Uni didn't even notice. She pulled a letter from her school satchel, her hooves shaking slightly. "Look! Look!" she cried. "I've finally been selected to try out for the Imperial Exam!" Tallydepp's mum gasped with delight. "Oh my dear Uni daughter, I know how hard you've worked for this and how much it means to you!" She pulled Tallydepp into a tight embrace. "I'm so proud of you!" Tallydepp laughed nervously. "It's only an invitation to try out for the exam, Mum. I might not even pass and get in. I've still got lots of studying to do yet. I've only got two days to revise all my spellings." "I'm sure you'll do fine," Tallydepp's mum said encouragingly. She cut a slice of Uni cake. "Here, have some cake to celebrate." Not all trophies were made equal however. Some are quite beautiful, in both design and representation, while others don't quite meet the mark, or a plain eyesore for the typical to even want to glance. After carefully judged all the available trophies, and a few cups of tea, a team of experts have come up with a list of trophies that will add… visual spark to your User Lookup. The Rubbish Avatar. It was released nearly 4 years ago on February 9, Y14. Yes, 4 years ago, and it is still uncommon to see it apart of someone’s avatar count. It’s one of those stubborn avatars. It’s a random avatar that has Neopians everywhere feeling frustrated. A Mote. A particle, or speck of dust. A tiny, inconsequential amount of something, usually pictured floating off to nowhere. A little bit of somethingness to punctuate the nothingness. This might be what always made me uneasy, when I thought of motes - that emphasis of space. At least, I think it was; before that day, when I started thinking something else. Queen Fyora watched the land below from the top of her tower. She saw the Meridell knights enter the citadel. She witnessed them fighting against the Darigans. As quickly as she could, she deployed a peacekeeping envoy of faeries to the citadel in hopes that they would be able to talk some sense into both sides.